Sunday’s SACMS concert, LYRIC IN TIME OF WAR, was not for the faint-hearted. Utilizing a format unfamiliar to many concert-goers, the American String Quartet wrapped their exquisite music around poetry by Tom Sleigh and Phil Klay’s narrative. A tribute to Veterans’ Day, the result was far from the “Don’t Sleep Under the Apple Tree” genre of music, miles away from the flag-waving parades and jolly speeches and continents away from familiar tributes to “the boys.” This concert was alternately beautiful, gut-wrenching, shocking and magnificent. How to do all that in an hour and a half? It’s like a puzzle and it took some getting used to. Beginning with the Bach Prelude from the Well-Tempered Clavier and moving forward to Tom Sleigh’s poetry, the music was interwoven with the lyric narrative and the free verse, and the whole portrayed war with all its effects. Assembled finally at the last strand of Beethoven’s Quartet in F Minor, the pieces came together like shrapnel speeding backwards into the grenade. This was an experience of war as understood by composers, musicians and two writers, and the tone of profound sorrow and awe was conveyed to the audience. This was an experience of war as understood by composers, musicians and two writers, and the tone of profound sorrow and awe was conveyed to the audience. We’ve all been to concerts filled with beautiful, soulful music, but usually the experience evaporates after a while and two days later, we’d be hard-pressed to remember most of the selections performed. Not so with this concert. I for one did not drive home humming to the car radio, thinking ahead to dinner. I left this concert with the shadow of ordnance shells overhead, lives lost, the sounds of war, the pain of grief. The music so expertly performed by the American String Quartet so perfectly meshed with the poetry and narrative that it could have been composed for this very purpose. Was Bach or Bartok thinking of war when they heard this music in their minds? Perhaps not – but their music carries the emotional load expressed in the writing. And Shostakovich, in the unfamiliar Quartet No. 8 in C minor, was most certainly expressing the horrors rained down on Russia by Stalin. There was no mistaking the fear and anger he wove into his composition. 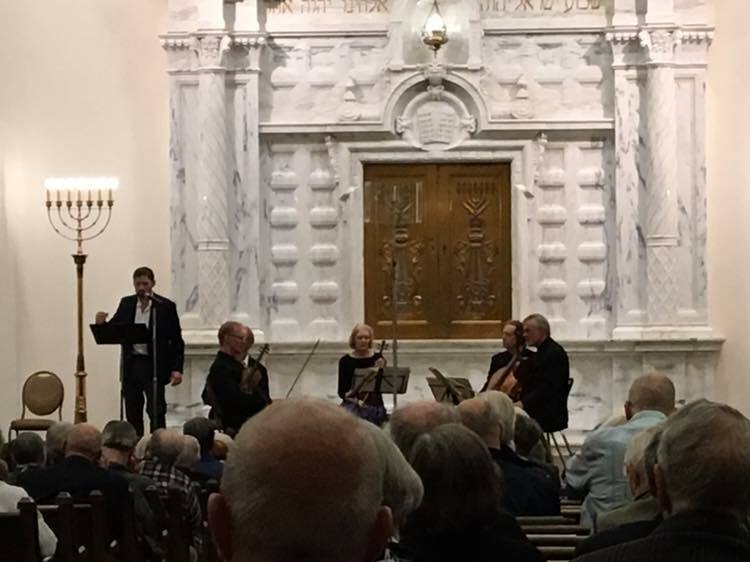 Some of the music allowed pauses for contemplation – just as in war, there are silences during re-loading, I suppose – but the overwhelming purpose of the concert was to express what veterans experience and to help all of us appreciate their courage and the utter senselessness of war. Our 76th season resumes January 27, 2019, with the exciting Cavatina Duo along with the world premiere of a composition by San Antonio’s own Matthew Dunne. Here’s a promise of more stellar music!